Pseudomyxoma peritonei is a rare disease of the abdominal or peritoneal cavity. The majority of cases result from a ruptured mucus secreting adenoma of the appendix. More rarely, the condition arises in other parts of the bowel, in the ovary in females and in rare cases, in other organs such as the bladder. The disease is due to the presence of a large amount of mucinous fluid with the consistency of jelly in the abdominal cavity, and is often commonly referred to as ‘Jelly Belly’. The mucus is produced by cells that have spread and grown on the peritoneum which lines the abdominal cavity. 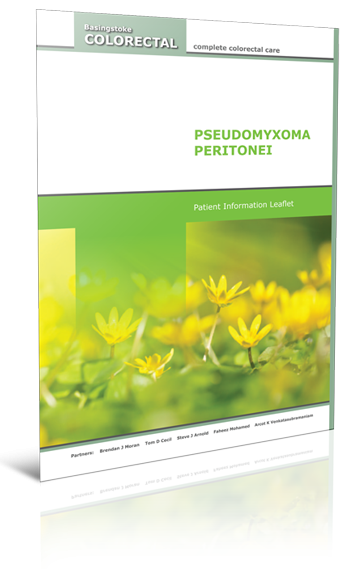 Pseudomyxoma peritonei is often referred to as being a ‘borderline malignant’ condition. The characteristics of a malignancy are that it spreads via the lymphatic system to the lymph nodes, and by the blood vessels (vascular spread), thus reaching the liver, lungs, brain and other tissues. Pseudomyxoma peritonei spreads only within the abdominal cavity in the majority of cases and does not spread via the lymphatics or the blood stream. However, it is not completely benign, as it continues to grow and eventually takes over the peritoneal cavity. If untreated, it will result in compression of the abdominal organs, making normal nutrition no longer possible. The complications of malnutrition (predominantly infection such as pneumonia), and complications following surgical treatment of the disease are common.